No doubt: this isn't the same old slug gun. By now, my experience with slug guns spans some four decades. As my eight-one years young father likes to remind me, it wasn't all that long ago where the notion of sighting in a slug-thrower was being able to hit a plate at 50 yards. Dad also likes to remind me that what I've done, he likely did it first (and at least twice)-- but that's a story for another day. That was it; back then then was considered as good as it got. If you could do that, it was considered sighted in by many. Except for one notable but lamentably short-lived bright spot, the fully-rifled Browning A-Bolt 12 gauge, slug guns as a general class have been sorely lacking. They have been rifles that don't perform like rifles. Not like good rifles, anyway. It has been so bad that I suppose some people don't even consider them rifles, but of course they are. If you have rifling in the barrel of a shoulder-fired long gun, obviously you are using a rifle whether that rifle loads from the muzzle, is centerfire, rimfire, or uses Reifenhauser style 20 gauge cartridges. During the Napoleonic wars the British had special rifle units, armed with rifled muskets known as the Baker Rifle. The rifle has been with us for a very long time indeed. One thing to consider with 20 gauge slug rounds is that their stated velocities as published on the box are highly unlikely to be much more than wishful thinking. It isn't just one manufacturer, it is all of them, and there is a reason for this. The test barrels used for 20 gauge saboted slug rounds are 30 inches long, the "industry standard." Yet, you won't easily find a 30 inch barreled factory rifled slug gun, if at all. The only way to really know under a specific set of ambient conditions to to chronograph shot strings, as is done later on in this article. However, if you want a more accurate number than is printed on the box, just subtract 125 fps from the stated velocity of the load. It works out quite well here for the preferred Federal Barnes 1900 fps load, but of course when the specific shell is changed, so is everything else. For example, precise ballistics are not readily available for the Remington loads, but I can give you an idea. Remington claims the PRA20M 3 in. AccuTip has a MV of 1900 fps, retaining 1438 fps at 100 yards. That equates to a static BC of .13, abysmal even by slug gun standards. It suggests a 6 inch point blank range of 164 yards. Using a more realistic MV of 1750 fps, the 6 in. PBR is 153 yards. If it shoots the best in your gun, then it may well be your choice-- but it does have less retained velocities at all ranges than the Federal Barnes load, with less penetration as well. Not a huge consideration if your hunting ranges are inside 100 yards, or if the game is whitetail deer. At extended ranges, or for tougher game (bear) opting for a tougher bullet with more velocity on target and superior penetration just makes good sense. Though twenty gauge shell itself is woefully lacking in standards, 22  24 inch barreled 20 gauge slug guns appear to be the most popular. There are no clear standards in rate of twist for 20 gauge slug gun barrels, either, ranging from 1:24 and 1:28 to 1:35 or so. It has to be a bit of a challenge for ammo manufacturers to come up with things that work well in all applications, as the 20 gauge shell itself has no precise standards in the sense that metallic cartridges may have. Not only can a typical 20 gauge shell be approximately (very approximately) 2-3/4 inch or 3 inch unfolded length, unfolded lengths don't apply to brass. With saboted slugs nested entirely inside the hull, overly generous freebore is a certainty. By now, after four separate range sessions and over five hundred rounds later, there is a lot more that can be said about Savage's 220F. It appeared to be a revolutionary slug gun at first blush for the reasons stated in the original article, but now I'm quite convinced of it. 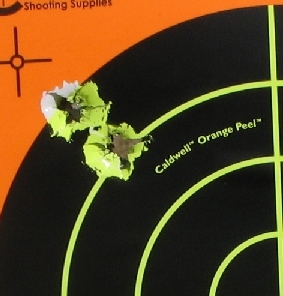 It has shot MOA at both 100 and 150 yards for me, and while the first 200 yard testing resulted in roughly 3-1/2 inch 3-shot groups, the last shooting session produced 200 yard groups inside 3 inches. The Federal Premium P209XT1 load proved to be the most accurate ammo tested in the Savage 220F, at any range. 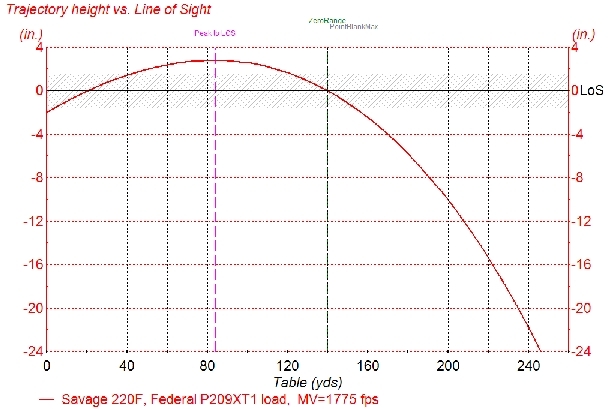 Of the seven different types of ammo tested, the Federal Premium P209XT1 3 inch loads with the 5/8 oz. Barnes Expander polymer tipped bullets proved to be the best, at least in this individual rifle. 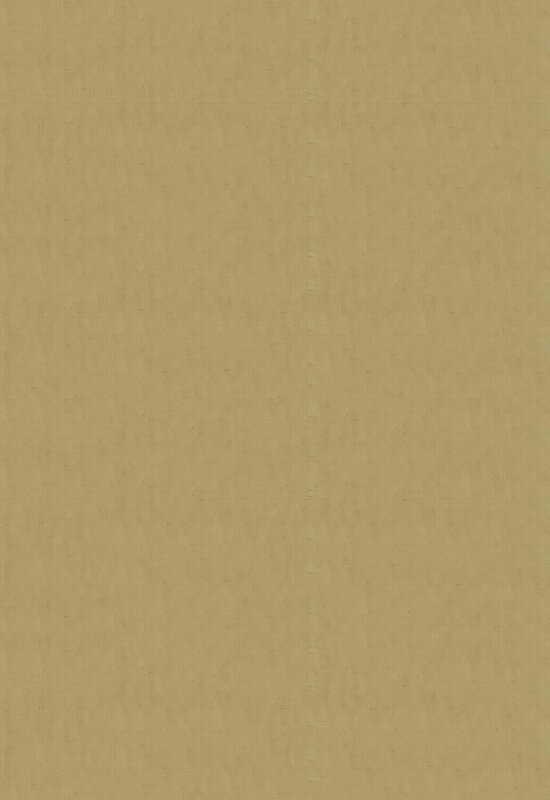 Of the rest, the Winchester 260 grain Partition Gold SSP203 loads did quite well also, but yet still a clear notch back from the Federal Premiums. Inside 100 yards it is unlikely to matter, but the Federal Premiums shot more consistently by a fair amount, and the terminal performance of the Barnes Expanders is a known quantity-- meaning they have been spectacularly good in my experience. Both Dad and I just used very similar bullets to bag our respective bears in Minnesota just a month and a half ago. 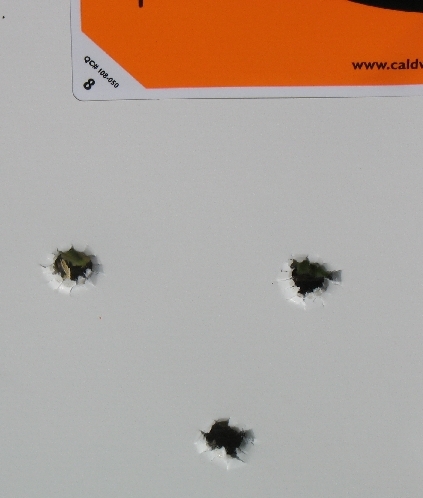 On the board at 100 yards on the most recent day of testing, here's an example of how the Federal Barnes loads did. If you look close, you'll see where the first two shots cut the very same hole. One thing you might want to keep in mind is barrel heating. Groups tend to open up with hot barrels, of course, but when plastic sabots are used it is even more important. The more patient I was about letting the barrel cool between shots, the tighter the groups became. I'm fortunate to have my own private shooting area, so it is easy to move targets, shooting benches, or both around as necessary to shoot at any range that seems appropriate. 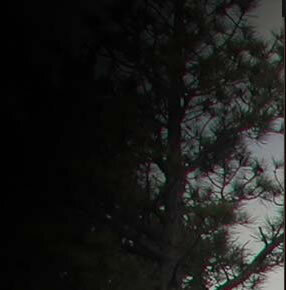 Here's how things look at 150 yards as laser-verified by my trusty Leupold RX-1000 laser rangefinder. If it looks like a football field and a half, it is only because it is. 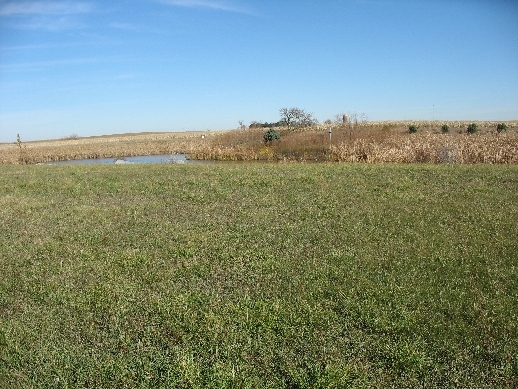 The white speck on the far side of the pond is the target. I was sighted in about three and one half inches high at 100 yards. Here are the first two shots at 150 yards-- although no whitetail I know could have possibly been standing to accept the second one. As a friend of mine likes to say, sometimes I seem to flinch correctly, blind hog finding the acorn and all of that. There's always the nut behind the but involved-- I'd imagine many shooters will get even better results in their 220F's once they find the load their individual gun likes to be fed. When I miss, I generally write it off to my keen and otherwise highly developed lack of ability. Time to drag things back and give it a go at 200 yards, doing an informal drop test at the same time. 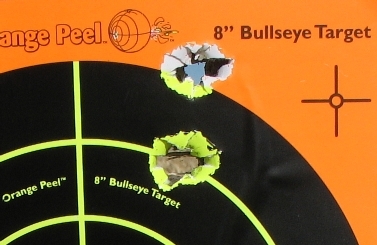 The first three shots out of the Savage, aiming dead on at the top target, dropped about 11-12 inches, forming a triangular group that measures just inside 3 inches center to center. In other words, the group went from about 3-1/2 inches high at 100 yards to roughly 7-8 inches below point of aim at 200 yards. After all this, it gives me a fairly good idea of what the external ballistics are actually like out of this rifle with this load. Average velocity, as recorded by the CED Millenium M2 chronograph, is 1745 fps. Many bargain-type consumer chronos tend to read high, some higher and higher the older they get. That's why I went to a pair of CED Milleniums a few years back, and haven't looked back. Sometimes, bad data is taken as better than no data at all. Please see the U.S. Federal budget for more details on that one. 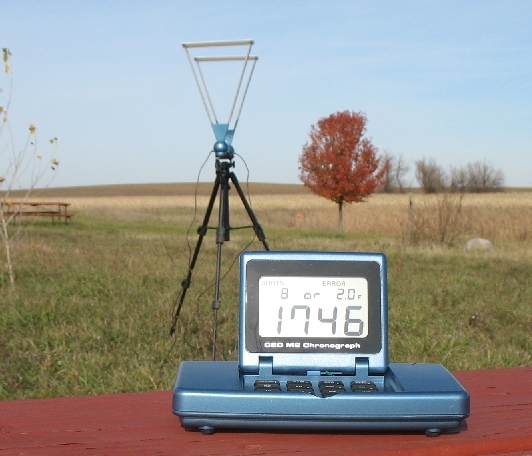 The 15 foot recorded velocities were 1731, 1755, 1763, 1734, and 1746 fps for an average of 1745.8 feet per second. The Standard Deviation is 12.15. A static Ballistic Coefficient applied to the tipped Barnes Expander of .19 is good enough for government work. Tracing back to the muzzle, correcting the 15 foot intrumental velocity to actual muzzle velocity equates to about 1775 fps. Roll it all together with a 6 inch kill MPBR indicates a true target zero of 141 yards and we get something that approximates a 165 yard PBR. So, essentially it is center of the body hold on a whitetail to 165 yards. You can sight in 3 inches high at 80 yards, or zero at 141 yards which (with a 1.5 inch scope height with a "standard" atmosphere) which is close to the same thing. Granted, this might be considered "too much information" by some, the reason this type of data is rarely included in a review. The short version of all this is to suggest an initial sight-in of 3 inches high at 80 yards, then confirm your POI at 165 yards. For most hunting applications, this very quickly gets you where you need to be with the Federal P209XT1 load. If your hunting conditions don't allow for longer range shooting, just the standard 100 yard zero should suffice. Using a 3 MOA reticle subtension hold point, or something like the 3 in. @ 100 yards line on the etched Bushnell Ballistic reticle on the tested rifle, will take you from 165 yards to right at 195 yards. Like anything else, you are the one that has to determine your own complete confidence level. 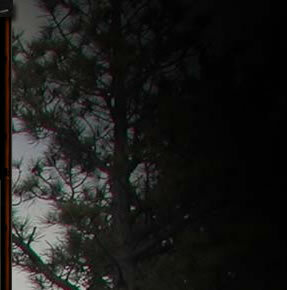 Like Jack O'Connor repeatedly expounded, the maximum point bank school or range (or top of the shoulder hold as Mr. O'Connor wrote) style of hunting is good hunting, and awareness of ambient conditions (wind), animal stance, and animal movement mandates that the more experienced hunters adjust their maximum shooting distances to closer ranges in concert. A representative view of the exterior ballistics of this individual rifle with this individual load under the tested ambient conditions follows. This is quite an achievement by Savage Arms. To put in your hands such an excellent handling, pleasant shooting little rifle that can easily handle most anything in North America out to 165 yards right out of the box, cleverly disguised as "slug gun" is something that most everyone can appreciate. I don't think Savage will be able to build the 220F's fast enough and I hope that Federal and Barnes can fill the demand as well. One of my favorite all-time video spots, 30 seconds in length, is on YouTube right here: http://www.youtube.com/watch?v=Qc99SiKqoJo . At the end of it, Savage CEO Ron Coburn confidently mentions what has to be the understatement of the year, If you think this is the same old Savage . . . think again. As far as the Savage 220F goes, I don't think it can be put any better than that. It is both a bargain and supremely competent slug gun, the likes of which has never been available before from anything remotely near this price category-- or in some respects, at any price. I'm very glad I bought mine and I think you'll be more than glad you bought yours as well. It hits on all cylinders, and like many large bore rifles-- if you can hit it, you can eat it. A lot more people are likely to be extremely well-fed this year, courtesy of the new 220F. This new Savage has better accuracy at 200 yards than old Foster slug guns had at 50 yards and the Savage delivers over 300% the effective hunting range with far better handling and far less recoil. If you think the Savage 220F is the same old slug gun, think again. Update: Thursday, December 3 (today) was the opening day of the late firearms season. I had an open Ford County tag, and my 81 years young father was ready to go hunting. Hunting and finding are two different things, of course, particularly when you have a sea of standing corn still out. But, that's why they call it hunting. Meeting my Dad, I asked Mom what type of deer she wanted. Her reply was, "A tender one." With a gusty chill in the air and a few snow flurries in the air, Dad and I made the trek. With standing crops there isn't much to see in corn and bean land, of course, but if you don't get out there you can be assured of nothing. At about four in the afternoon, with the temperature dropping into the twenties, a couple of does walked straight out of standing corn just over 150 yards away, and stopped. Dad whispered, "What do you think?" The 220F came up and barked off-hand at the at the larger of the two young does, letting loose with a Federal Barnes Tipped as discussed before. The Federal Barnes blew through the doe like butter, taking off the top of the heart. 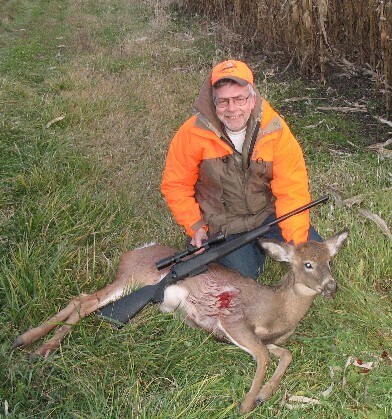 The doe bolted back into the standing corn, dropping dead about 15 yards in. Above is the result, with the exit wound facing the camera. Mom got her wish, a corn-fed "tender one" that is soon to be fine dining with no preservatives, growth hormones, artificial colors, or flavors. 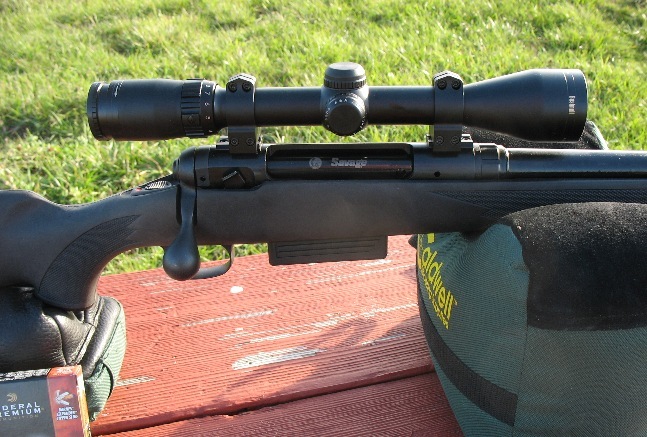 A great job by both the Savage 220F and the Federal Barnes load-- slug hunting just doesn't get much better than this.